Typed letter addressed to Mr. Otis Graeser of The Ohio National Life Ins. 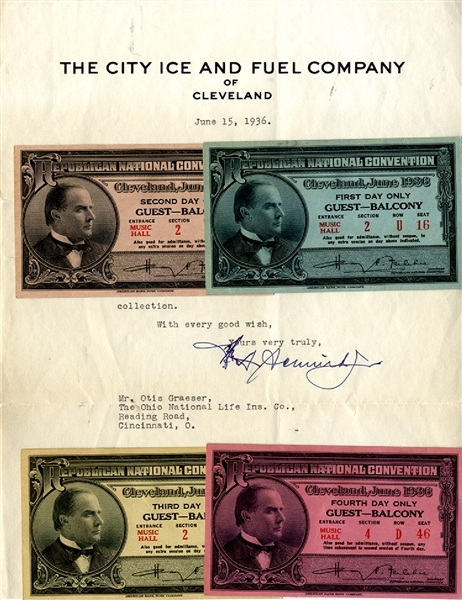 Co., 1936 and reads “Wonder if the enclosed ticket stubs to the Republican National Convention would be of any interest to you for your stamp collection...” With Four Stubs for the 1936 Republican National Convention held in Cleveland, Ohio. Includes 1st, 2nd, 3rd, and 4th day passes. Fine condition.